Our sugar white sand beaches and the natural beauty of our coastal waterways along Orange Beach, Gulf Shores and Ft. Morgan provide the perfect setting for wedding ceremonies and receptions aboard one of our luxury boats. 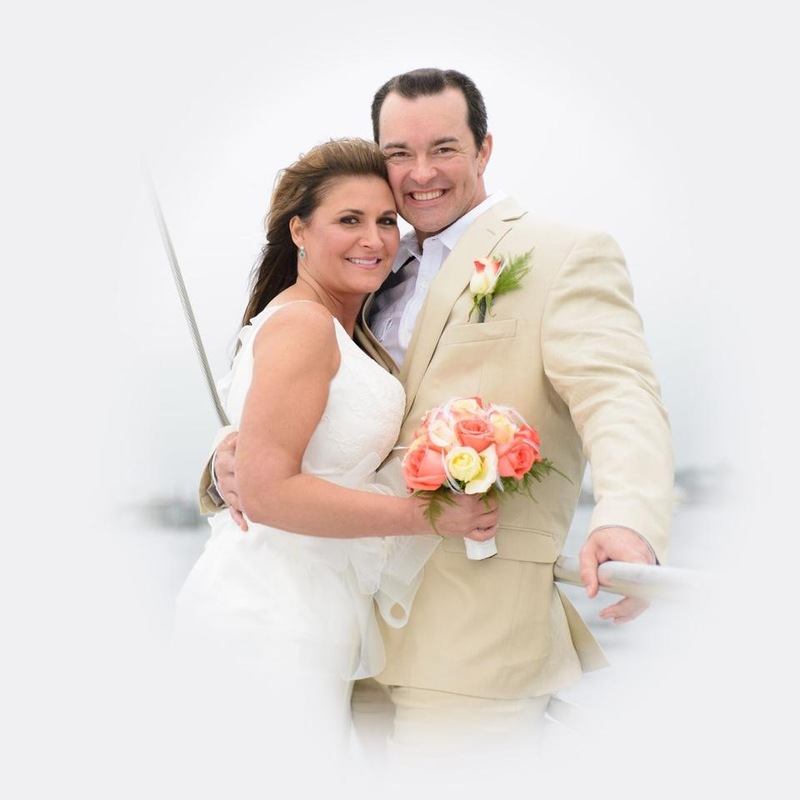 Boat charter weddings provide all of the sights and sounds of the Alabama Gulf Coast, but from the privacy of a charter boat that can transport you to your ideal location to exchange vows. Whether you plan a small casual gathering with just a few close friends or your vision is for a larger group with elegant catering and live music; AAA Charters can help you plan your ideal charter boat wedding events. We can also transport your wedding party to one of our local waterfront restaurants for a reception after the ceremony. Tell us your dream event, and we will help make your dreams come true. One of the growing trends on wedding charters is the “First Look”, where the bride and groom see each other before the ceremony and before anyone else sees them. The only other person present is the photographer to capture this magical moment. This creates an opportunity for unique intimate moment. The first time the bride and groom see one another on their wedding day is a special moment many look forward to treasure forever. Seeing each other before the ceremony provide the unique opportunity for a couple to share the exciting, romantic and often emotional experience privately. The days leading up to the event and the wedding day often involve jam packed itineraries with family members and friends at every turn. This “First Look” Moment may be the only alone time the couple has on their big day. When the whirlwind of events is over, most couples say there’re glad they took the chance to enjoy a special, intimate moment with just the two of them. Another benefit for opting for the first look is that it eliminates rushed photo shoots between the ceremony and the reception, which usually involves most guests standing around for various 15 minute time shots designed to capture various combinations of the wedding party & guests. Taking these photos before the service gives the photographer ample time to get plenty of beautiful, creative shots of all present. Everyone will be more relaxed, the ladies hair and makeup will be fresh, and the couple will have a wide selection of photos of the day from which to choose. Since the photographer will be taking pictures throughout the charter, the customary post-ceremony lull of waiting around is eliminated and your guest are free to enjoy the entire event. An overwhelming majority of couples who opted for a “First Look” say that seeing their spouse-to-be before the ceremony had a dramatic calming effect. Going into the ceremony collected and at ease allows the bride and groom to be completely in the moment and enjoy every second of it. After all, a wedding is meant to be enjoyed by everyone, especially by the couple exchanging the vows. Whether your dream wedding is a small casual beach vibe gathering at sunset, or your ideal event is for a larger group with a full bar, live music and eloquent catering; AAA Charters can help you arrange your perfect wedding and/or reception boat charter experience on the Alabama Gulf Coast. The natural beauty of the Alabama Gulf Coast sugar sand beaches, abundant wildlife, and sprawling waterways provides ideal backdrops for getting married on the water; but nature also involves weather, which cannot be controlled. AAA Charters will also make arrangements to reserve appropriate backup space to have your event in case weather will not permit getting married outside. We have over 40 years of hospitality experience and can handle switching venues if necessary and still make sure your event is enjoyed by all. Wedding party posing for photos under Perdido Pass Bridge. Catered Lunch for a Luxury Sailing Cruise. Elegant Spring Bride enjoying her Orange Beach AL Wedding on the bow of a luxury sailboat.